Sfc /scannow is a Command Prompt command that allows you to scan your Windows 10 system for errors and repair them. This is a useful feature, but number of users reported that sfc /scannow stops and can’t continue. This can be a big problem, but there are several solutions that you can try. Sfc /scannow stops, how to fix it? Sfc /scannow stuck at verification, at beginning system scan – According to users, SFC scan can get stuck at verification or at the beginning of the scan. However, you might be able to fix the problem simply by replacing the corrupted files. Sfc /scannow frozen Windows 10 – This is another issue that can appear with the SFC scan. 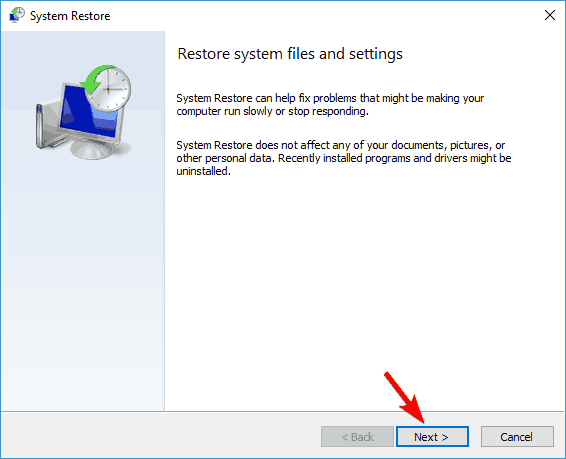 To fix this issue, it’s advised to restore your PC using System Restore and check if that solves the problem. 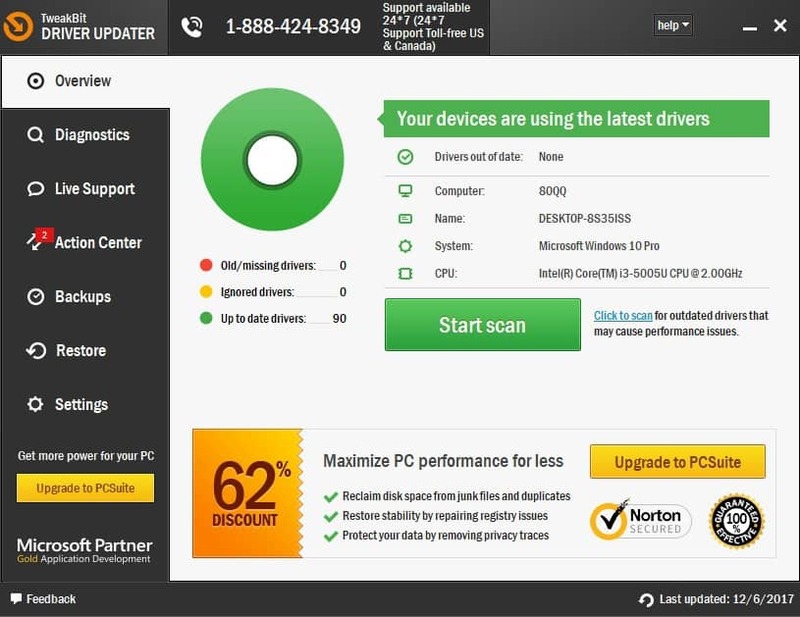 Sfc scannow nothing happens – Couple of users reported that nothing happens while using SFC scan on their PC. If that’s the case, try using the DISM scan instead and check if that solves the issue. Sfc scannow stops scanning – According to users, sometimes an SFC scan can stop completely on your PC. This is a strange issue, and it might be caused by Turbo Memory feature. Simply disable this feature and check if that solves the issue. Sfc /scannow fails Windows 10, 8.1, 7 – This problem can appear on almost any version of Windows, and Windows 8.1 and 7 aren’t exceptions. However, you should be able to fix this issue by using one of our solutions. Sfc scannow stops you must be an administrator – SFC scan requires administrative privileges in order to run, and if you’re having any issues with SFC, be sure that you’re using Command Prompt as an administrator. Sometimes improper shutdown or power loss can cause certain files to become corrupt and stop the sfc scan from completing. Almost any file on your PC can cause this issue to appear, and in order to fix it you need to find the corrupted file and replace it with a working file from a different Windows 10 PC. 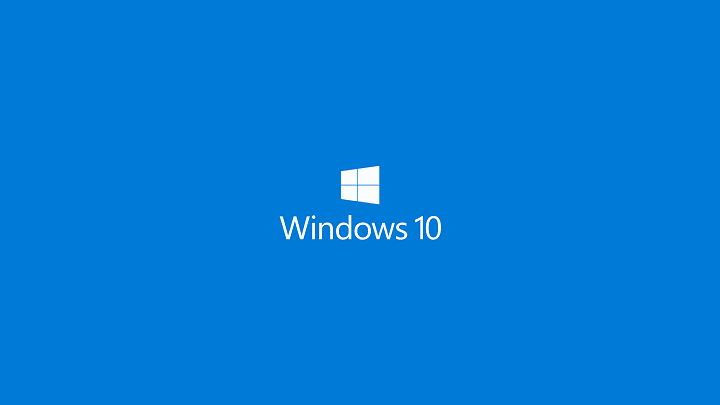 Bear in mind that this file needs to be from an identical version of Windows 10, so if you’re using 64-bit version of Windows 10 be sure to get this file from another 64-bit Windows 10 computer. 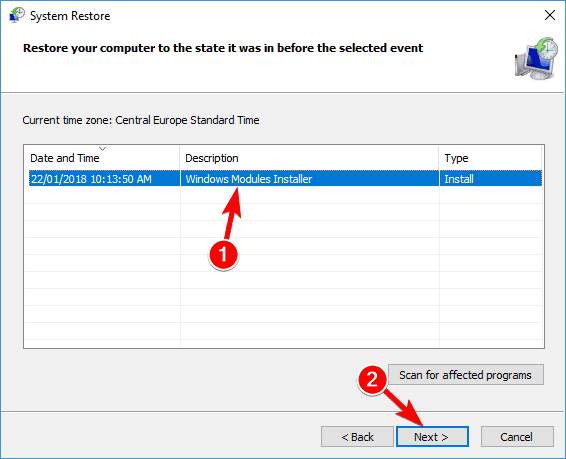 Press Windows Key + S and enter restore. 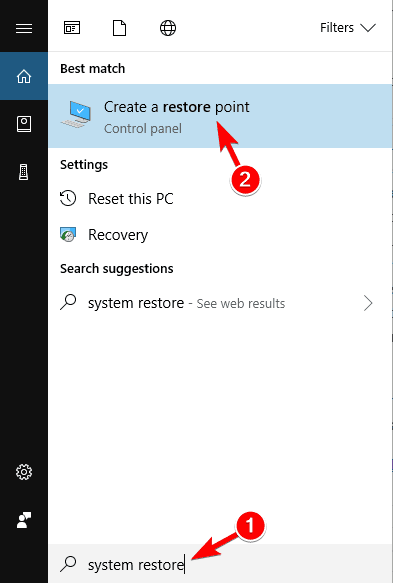 Select Create a restore point. System Restore window will open. Click Next. 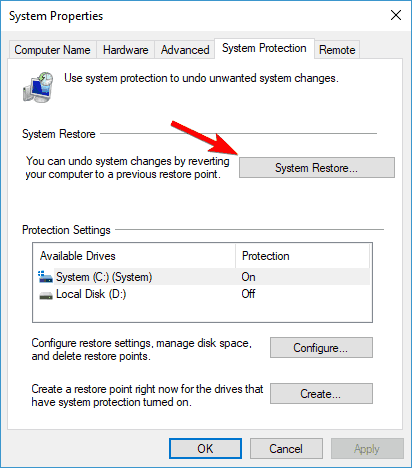 Select the Restore point you wish to return to and click Next. When Command Prompt opens enter dism /online /cleanup-image /restorehealth and press Enter. Users reported that hardware problems can cause sfc /scannow to stop. According to them, faulty RAM can sometimes cause these issues, so be sure to test your RAM with MemTest86+. In addition, you can also try removing and replacing one of your RAM modules. Click the Start button, hold the Shift key and click the Restart button. When your computer restarts choose Troubleshoot > Reset this PC. You can now choose between Remove Everything and Keep my files option. Both options will remove all installed third-party applications but Keep my files option will save your personal files and documents. If required, insert Windows 10 installation media. Choose Only the drive where Windows is installed > Just remove my files option. Follow the instructions on screen to complete the reset process. If you can’t complete sfc /scannow command on your PC, you might want to try updating your drivers. According to users, several of them managed to fix this problem simply by updating their Rapid Storage drivers. 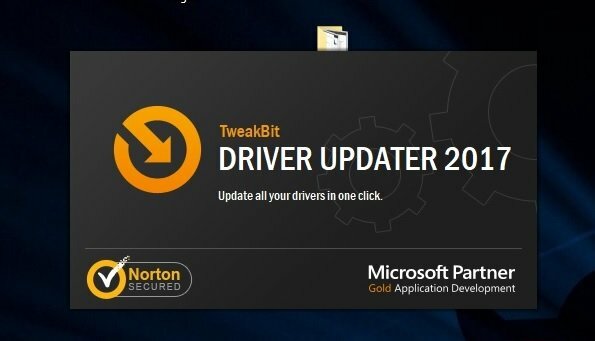 This is rather simple, and in order to update your drivers, you just have to visit your motherboard manufacturer’s website and download the necessary drivers. In most cases, the drivers will come with a setup file so you can install them with ease. Download the drivers and extract them to a desired directory. In this example we’re using Desktopdrivers directory, but you can extract them anywhere on your PC. Open Device Manager. You can do that quickly by pressing Windows Key + X and choosing Device Manager from Win + X menu. Now locate the device that you want to update, right-click it and choose Update driver from the menu. Now click the Browse button and locate your drivers. 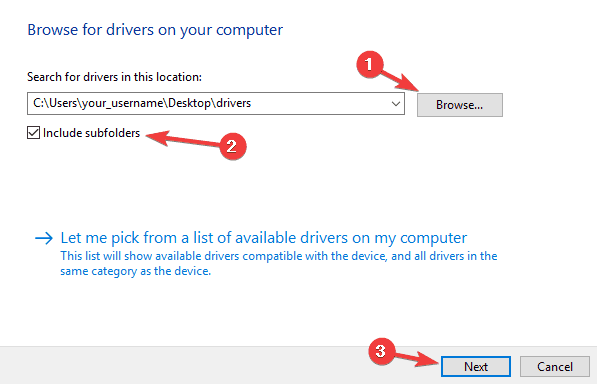 In our example that would be Desktopdrivers, but the driver location might be different for you on your PC. Once you find your drivers, check Include subfolders checkbox and click Next. After the driver is installed, the issue should be completely resolved. 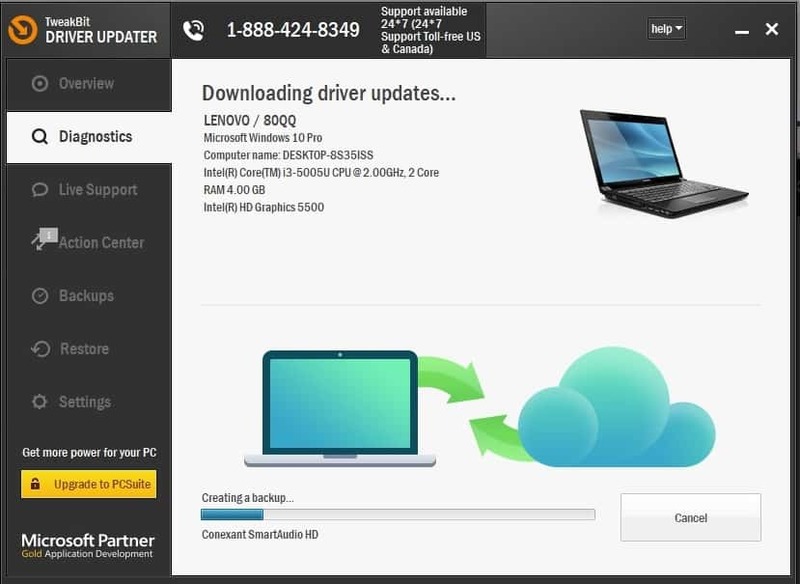 Installing the drivers manually can be a long and tedious process, and if you don’t want to install all your drivers manually, there are many great automated solutions that can quickly install all missing drivers for you. According to users, features such as Turbo Memory aren’t fully compatible with all hard drives, and sometimes this feature can cause issues with the sfc /scannow to appear. To fix the problem, it’s advised to disable or uninstall this feature entirely. Several users reported that disabling or uninstalling this feature solved the problem for them, so be sure to try it out. Before we start, we have to mention that this is an advanced solution, and if you don’t perform it correctly, you can cause issues with your system. In addition, system32 directory is closely related to your system, so any changes to it can affect your Windows installation. In worst case scenario, your Windows might not be able to boot, so keep in mind that you’re using this solution at your own risk. Several users reported that they managed to solve this issue simply by taking control over a system32 directory. There are many ways to do that, and the best might be to use a third-party application. We explained in detail how to take ownership over a directory in on of our previous articles, so be sure to check it out for more information. Once again, tinkering with system files and directories can lead to issues, so you’re using this solution at your own risk. If you’re not familiar, Safe Mode is a special segment of Windows that runs with default applications and settings, which makes it perfect for troubleshooting. Several users reported that they were able to run SFC scan from Safe Mode, so be sure to try that. Now you should see several options available. Choose Troubleshoot > Advanced options > Startup Settings and click the Restart button. 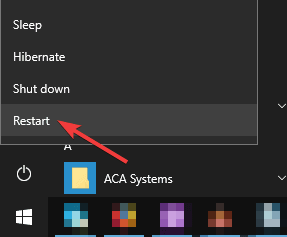 Once your PC restarts, you’ll be presented with a list of options. Select the desired version of Safe Mode by pressing the corresponding key. Once you enter Safe Mode, try to run SFC scan again. Several users reported that SFC scan ran without any issues in Safe Mode, so be sure to try that. When Command Prompt starts, enter chkdsk /f C: and press Enter. You’ll be asked to schedule a scan and restart your PC. Enter Y and then press Enter. Your PC will now restart and chkdsk scan will automatically start. Keep in mind that chkdsk scan can take up to hour or so depending on the size of your disk drive. Once the chkdsk scan is finished, you should be able to perform SFC scan without any problems. If sfc /scannow stops, it’s usually due to corrupted files, and you can fix this problem by finding and replacing the corrupted files or by performing the DISM scan.